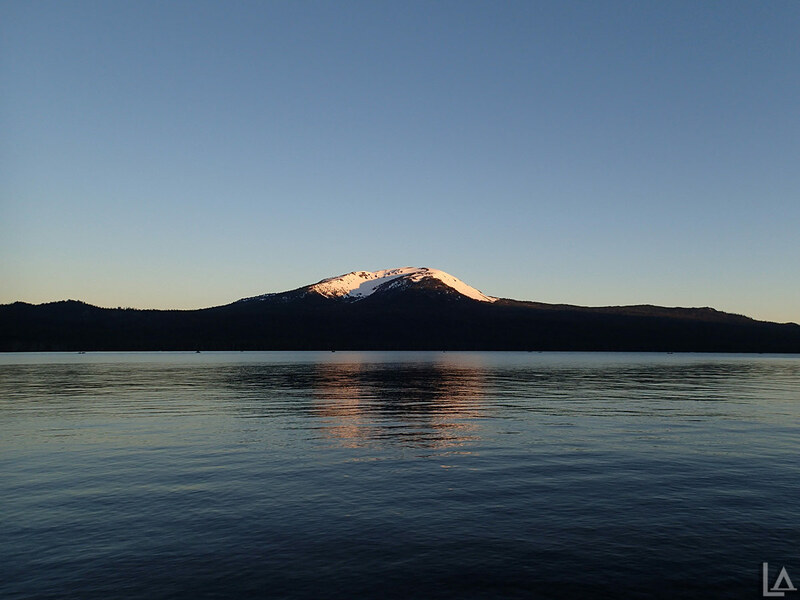 It's been a long time (pre-Loomis Adventures), but we finally planned a trip back to Diamond Lake. We took Friday and Monday off to make it a long weekend camping trip. As always, our Mini Adventurer was super excited to go camping. We were meeting my parents (staying at a different campground in their Airstream) and Uncle Pat at Diamond Lake campground. My friend Tyler and I decided to go camping this weekend near where we have hunted in the past on the SE side of Mt Hood. We were hoping our friends John and Ryan would join us, but they weren't able to this trip. Tyler and I met up at the hwy 35/48 junction and then continued on forest service road 4860 to look for a camping spot. Katie, Julian, and I spent the Memorial Day weekend camping in Central Oregon at Fall River camp ground. This is one of my favorite places in the area. 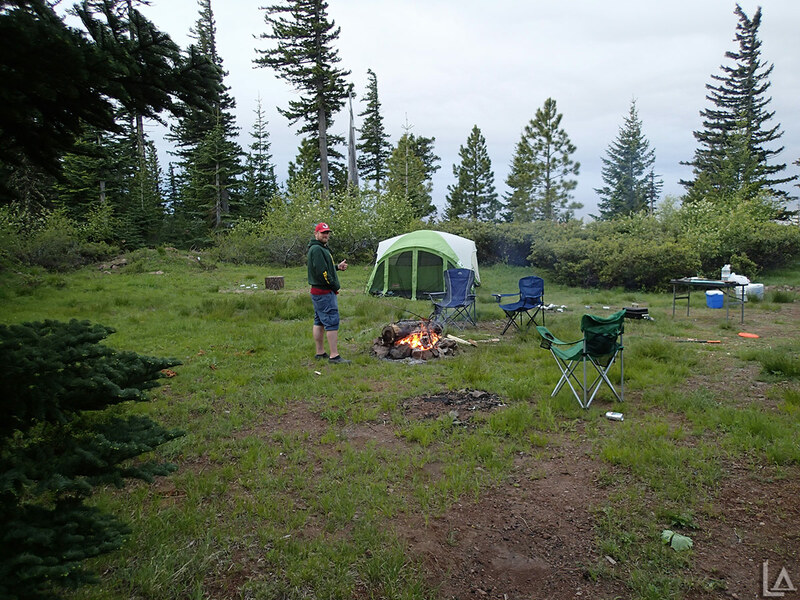 It is a primitive campground with no potable water and rarely crowded. We were able to easily find a spot when we arrived on Friday. 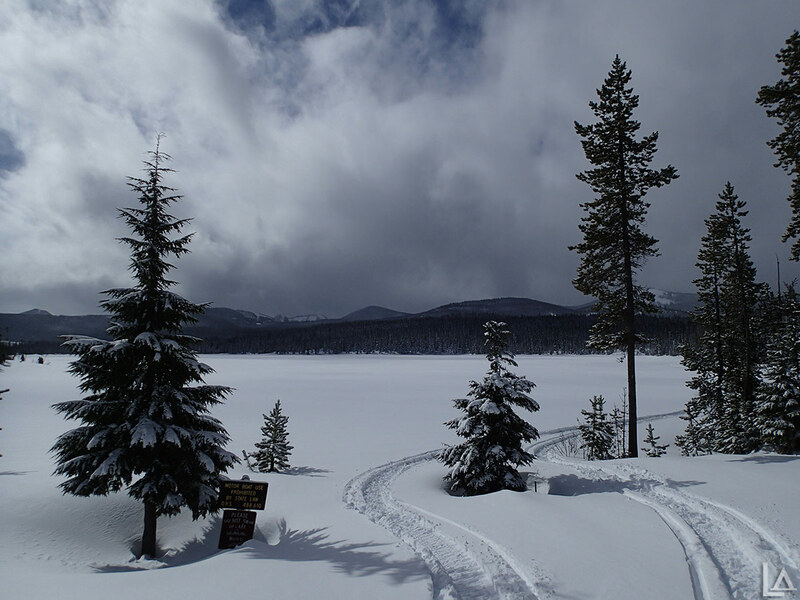 Olallie Lake, So much snow! 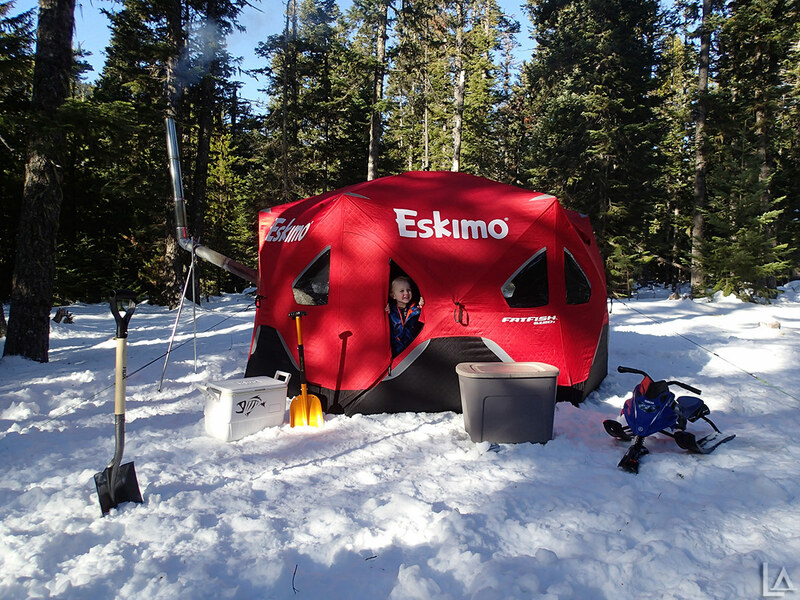 John and I spent the weekend camping at Skyline SnoPark and snowmobiling to Olallie Lake. We brought John's camper this trip. 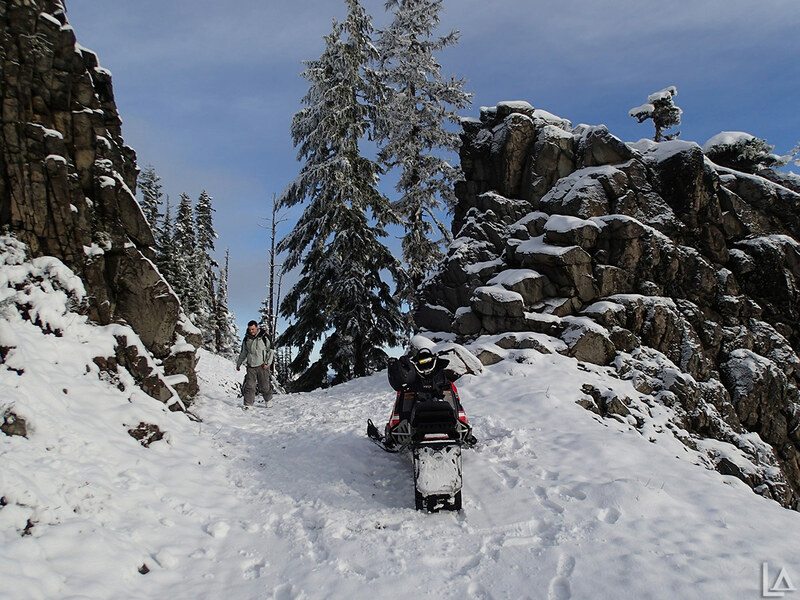 It is about a 34 mile snowmobile ride to Olalllie Lake from Skyline SnoPark. 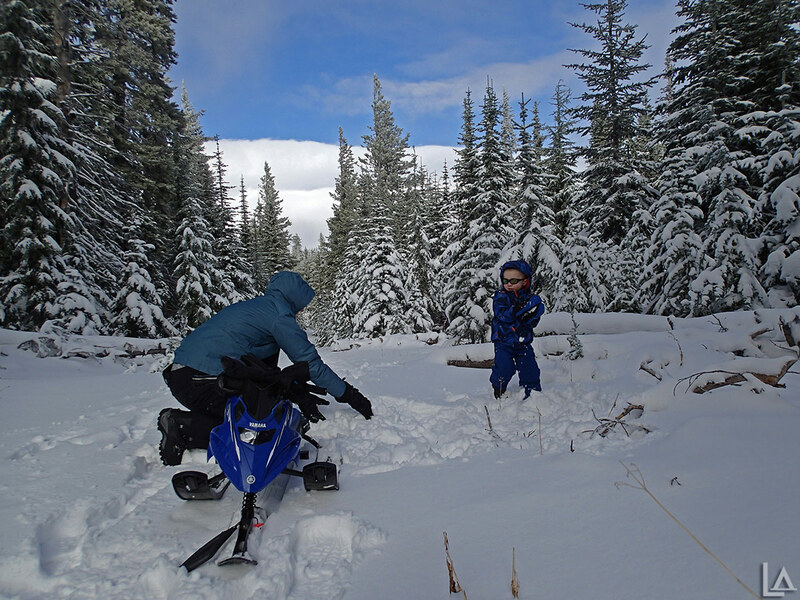 Read more about Olallie Lake, So much snow! After changing our plans last minute due to flight cancellations in San Diego, our Family Snow Day 2017 took place on Sunday. We had only ten of us this year with family from San Diego, CA and Reno, NV joining us. The weather was perfect with partly cloudy skies and a temperature around freezing much of the day.We had sun breaks and snow showers. My sister Jessica and her boyfriend Nathan came to visit us this weekend from Nevada. We had a full weekend planned with lots of snow play. 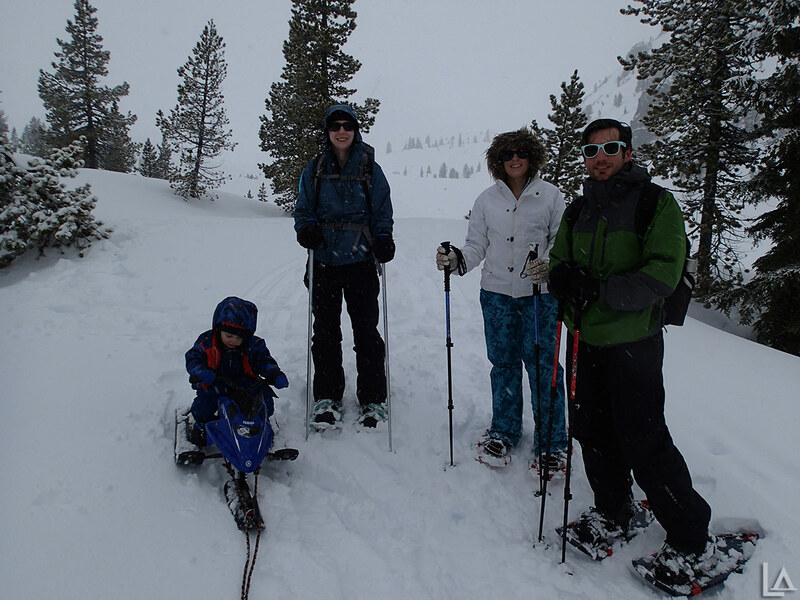 On Saturday we all decided to head to White River Sno-Park (off hwy 35) to snowshoe up to Boy Scout Ridge. This hike is about 2-2.5 miles (~1,800' elevation gain) depending on how far up you go and can have great views when the sun is out. It has been some years since we were last here and I am sure it was on another poor weather day. 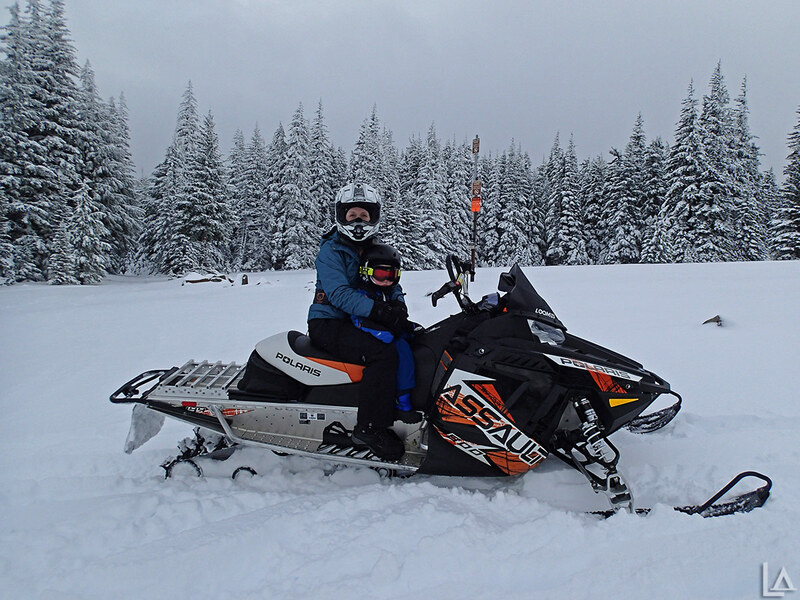 My friend John and I played hooky from work Friday and headed up to Little John Sno-Park on the East side of Mt Hood to snow camp and snowmobile. We waited to leave town until the freezing rain from overnight had thawed out enough to safely drive. 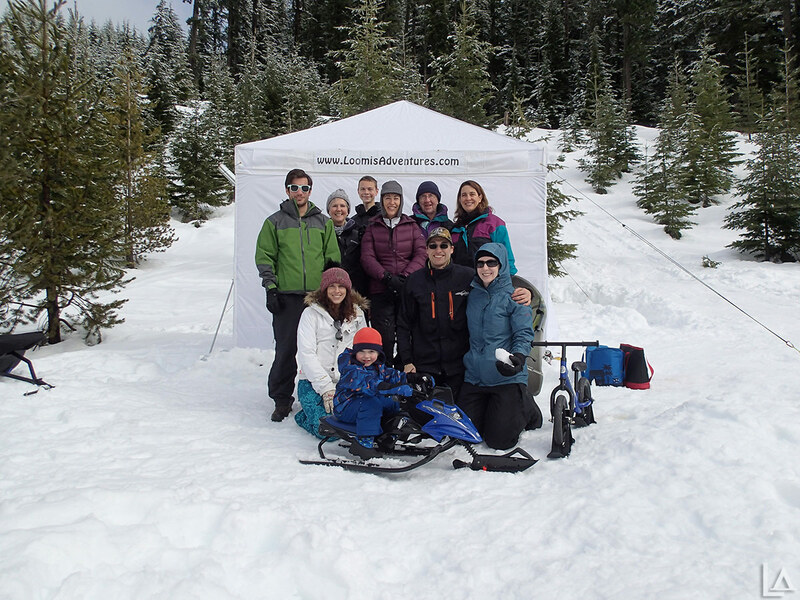 We arrived at Little John Sno-Park just before noon to snow showers and a temperature of 14°F. There was one other vehicle in the parking lot and lots of snow. Little John Sno-Park is a low elevation sno-park (3,300') just of hwy 35 between Mt Hood Meadows and Parkdale. It is not often we find this much snow here. I was excited. Katie and I both took Friday off to celebrate my birthday up in the snow. 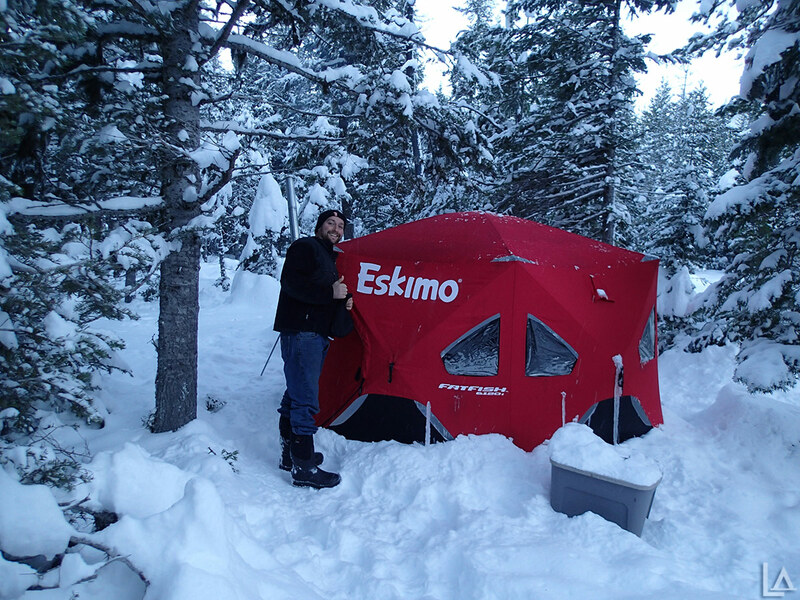 We had hoped to go snow camping, but the weather was not looking good overnight (rain in the forecast instead of snow). 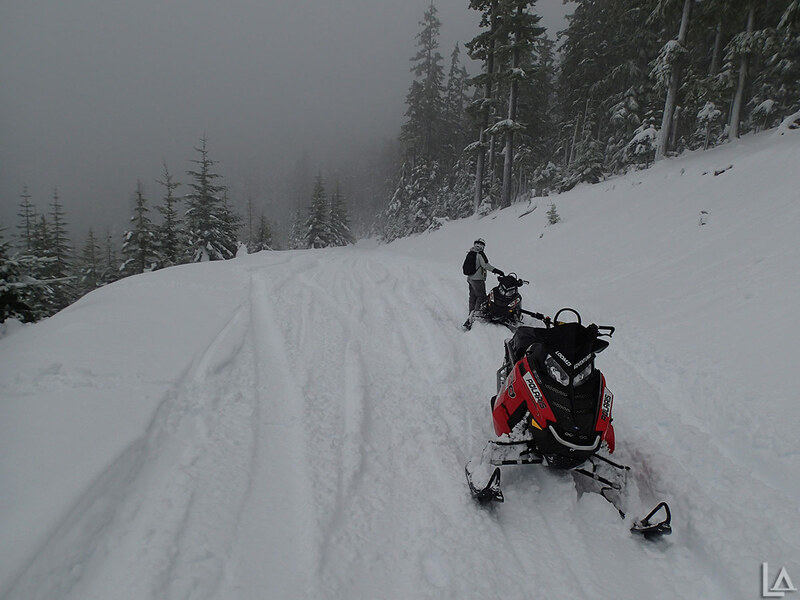 We ended up going snowmobiling for the day near Lookout Mountain (same place we were two weeks ago). Katie, our Mini-Adventurer, and I drove up to the base of Lookout Mountain (about 6,000' elevation) Saturday to play in the snow. We took Katie's Ford Escape for the first time in the snow and it handled amazingly well. No skill was needed to keep it safely on the road. We came across several other people out having fun in the snow. There was maybe 5-6" of snow by the time we made it to High Prairie (the base of Lookout Mountain). The weather was mostly cloudy with only a calm breeze and right around freezing. It was shaping up to be a beautiful day. We had our first real snow storm Tuesday night into Wednesday. The snow came down below pass level on Mt Hood finally. I was beginning to wonder if it would ever get cold with the record warm days we have been having this month. Being the first storm and a forecast of rising snow levels this weekend, I took Thursday off to see if there was enough snow to snowmobile. I took my friend Kevin and we headed to my customary early season riding area at Bennett Pass Sno Park. 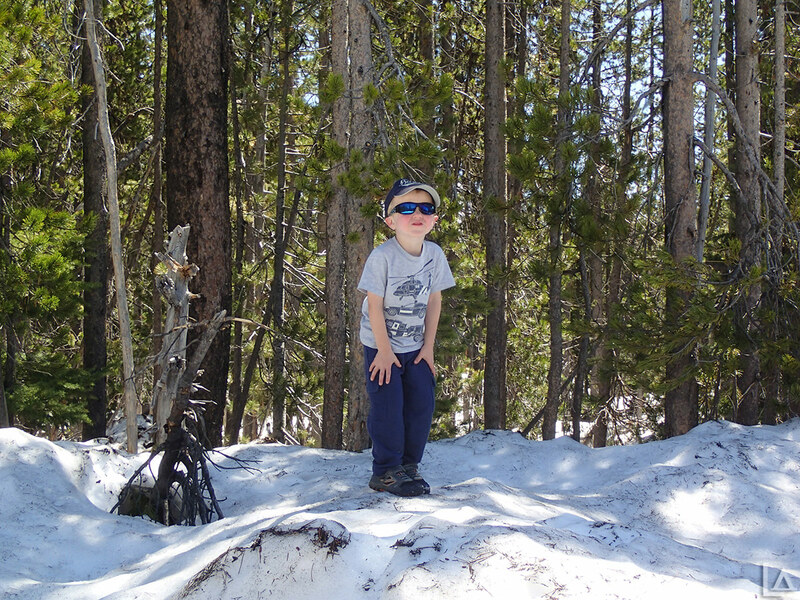 On Sunday, Julian, Katie, and I decided to hike the Old Salmon River trail #742A. It's a short (about 2 miles each way) out-and-back hike along the Salmon River. We took the boat out again on Saturday, this time with my parents. This was their second attempt for the season. 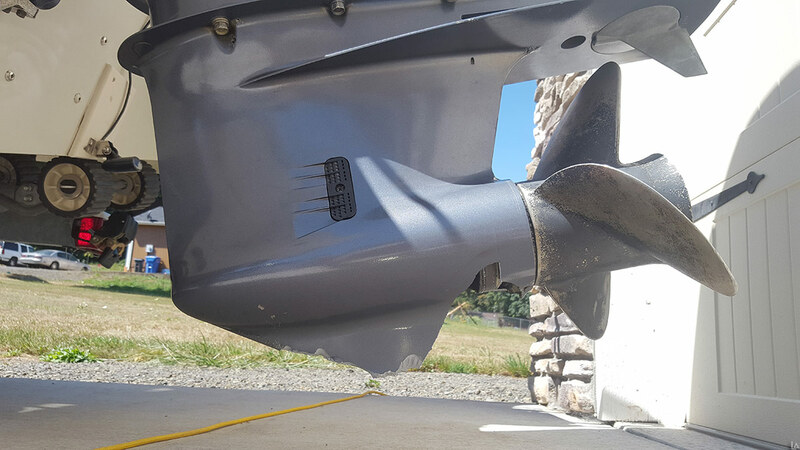 The first time we had motor troubles (the starter blew up and we never left the boat ramp). 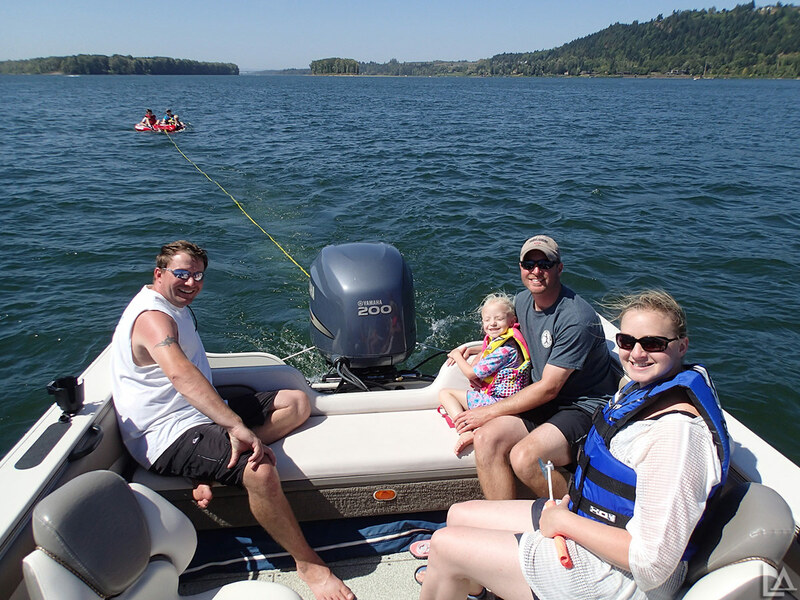 Today we launched from Meldrum Bar on the Willamette River just downstream from Oregon City. My Grandpa was with us too, so we had four generations aboard. With upper 90's forecast for the weekend we got an earlier start at the boat ramp Friday (Chinook Landing). We met my sister and her family at the ramp. Everyone piled in (8 of us total) and we cruised downstream. It was windy which helped it feel a little cooler. We tried to find a calm place to anchor, but the current was ripping everywhere.